As always, we shout out some of our industry friends who've had nice things to say and tell us about. Props to James over at Sonuus for the conversation about their new microphone and even sending us one. It's the new Loopa vocal looper mic, if you're interested! 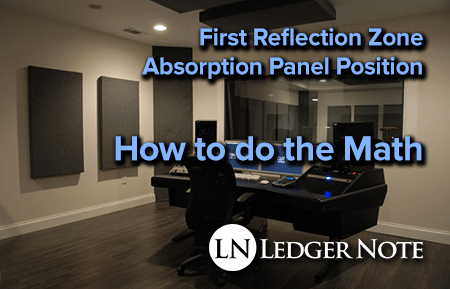 Regarding acoustic treatment, in your equation for the position of the first reflection panels on the side walls, it's stated as (y times x2) divided by (x1 plus x2). I'm having difficulty determining what y, x1, and x2 represent... it's not specified in your article... I tried figuring it out but to no avail. You're right, we didn't provide a legend at all! We borrowed that image from Real Traps who also don't provide a legend, but they do offer an explanation, which I'll explain with a drawing below. If you want to take a shortcut, what you can do is sit in your mix position and have another person hold a hand mirror to the wall. Have them move the mirror around and mark the area on the wall where you can see your monitors through the mirror. This works for hanging a cloud absorption panel on the ceiling as well. y is the distance from your ears in the mix position to the line your monitors create from side wall to side wall. This is all based on sidewall measurements with no diagonal distances. x1 is the distance of the monitors to the sidewall (should be equal on both sides). x2 is the distance of the center of your head to the sidewall. So d is the distance from the horizontal line between your ear and the wall to where you should place the center of the first reflection zone panel, measuring forward towards your monitors. This places them at the optimal position so the width of the panel can absorb as many reflections as possible from both speakers. I don't plan on quitting my day job to become an artist, so let us know if we can help further! New readers into this topic will enjoy our full depth exploration in our acoustic treatment guide. We appreciate the questions and are more than happy to help, so please never hesitate to send us an email, no matter the topic (at least try to keep it related to music though)!